Those of you that have been readers for sometime will know that I am not a fan of "Diets" or diet food, plans, or supplements. I am a fan of just one plan, the one thing that proved to be the tool that allowed me to get to where I am today..... A changed lifestyle, more specifically: eating less, eating better, and being more physically active. That being the case, I am strongly against providing a presence for any products, books, write ups, or links to items that do not fit in the above mindset. I have turned down some of each of these, including paid links. That being said, I have received a pre-release version of THE ENGINE 2 DIET book. I have to admit at first the title turned me off because of the word "Diet" but once reading more about the book I became more willing to give it a chance. I know by starting to understand more about it the book is based on a mostly plant based diet which I am not a fan of..... I like meat too much :) but I have started reading the book and will be better equipped to give my opinion in a couple weeks. 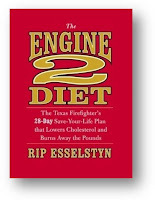 When Rip Esselstyn and some of his fellow Engine 2 firefighters from Austin, TX realized that their cholesterol levels were higher than they'd like he decided to do something about it. He created THE ENGINE 2 DIET program and in 28-days everyone lost weight, lowered his cholesterol, and improved his overall health. Rip decided to do a larger study to prove the effectiveness of his plan--not just for firefighters but for everyone. THE ENGINE 2 DIET is a lifestyle that begins with a 28-day program that will enable readers to lose weight, reduce the precursors to disease, and become physically fit. It's a clear-cut guide to eating a whole-food, nutrient-rich, mostly plant-based diet. THE ENGINE 2 DIET also includes recipes, meal plans, grocery lists, cooking tips, and a firefighter-inspired exercise program to boost metabolism, build strength and endurance. As a fireman Rip has helped people and saved lives, but with his Engine 2 Diet Plan he will help save lives on a much larger scale. I have been given the opportunity to give you, my readers, a copy of this book. This book is being officially published on February 25th. On that date you can be one of 5 lucky readers to have your own copy of this book. The easiest way to get an entry is to comment on this post. For commenting on this post you will receive one entry into the giveaway. You can then add additional entries by twittering this blog post by using this link: http://zi.ma/2big-e2d or by posting something about this giveaway on your blog using the same link http://zi.ma/2big-e2d Once you either twitter or blog about this giveaway please send an e-mail to info@2big.org with a link to your blog post or your twitter name and I will add one additional entry for you. While you are here why not subscribe to the feed or follow this blog? Been there done that - but I would be wary of 28 day programs. It is the consistency that matters. While you might achieve your goals in 28 days, if you had pushed hard to reach there, staying there would be really difficult. I would rather look for a program that can be part of my routine. Congratulations on your successes and continued success. As a Registered Dietitian I am SO GLAD and happy that you have done it this way. Good luck on your marathon training. My first was in Oct 08 and I said never again. Now I'm training for the San Antonio Rock n Roll. I'm a vegan and a runner who has lost over 100 pounds eating sensibly and changing lifestyle. I'm interested in what the boys at Engine 2 have to say - I'm guessing it will straightforward and sensible. It IS possible to live and train on a plant-based diet - as evidenced by what Canadian Ironman Brendan Brazier has to say in his book The Thrive Diet. We need to get more of this type of info out there!! Sounds like the book will be worth reading...I'm always interested in adding some good, healthy recipes to my arsenal. I was reading about this diet and wanted to find out more, which is how I ended up on your blog. He is advocating a lifestyle change (per an interview in the local paper), but also trying to get you to do it for 28 days. I've heard it takes 30 days to learn a new habit, so maybe that's part of the rationale. As well as you can see real results in your bloodwork by then. It sounds interesting to me as an athlete who is trying to lose weight and eat better. Plus I joined a CSA so I get a box of veggies I have to eat every week and some recipes would be grand. I'd love to win a copy of this book. :-) One thing that puzzles me is that I read it says no oil whatsoever. I assume that means olive oil as well. So for example, you stir fry with chicken broth. I'd like to know why that is so much better. 2008 changed my life I became a grandmother twice! In February we welcomed our first Grandson and in June our first Granddaughter truly a life changing experience for my husband and I. I have battled high cholesterol and weight issues for years. Trying on my own to lower them has virtually seemed impossible. Not wanting to suffer a stroke or heart attack and miss whatever years I might have with my grandchildren I decided to talk to my doctor about what medications might be available. While watching the news this morning I heard about this book and thought maybe this is one last chance to do it on my own, at least I feel it has to be worth a try! Looking forward to learning more. Working on 5th marathon and always interested in good food to fuel my runs. The drawing has taken place using Random.org. I took the comments on this post, and added additional entries for those that Tweeted it and those that blogged about it. Please send your mailing address to info@2big.org no later than Saturday February 28th, 12 midnight. I will forward these over to the publisher/sponsor so they can get your book out to you ASAP. Thanks for sharing this post.I will try the 28 day programs.